When it was released 50 years ago, The Sound of Music became one of the most successful films of all time. It was based on the true story of the von Trapp family (above) - but what did they think of it and was their life really like it was portrayed in the movie? "Everyone thinks the Sound of Music was exactly the way things happened, and of course it wasn't because there had to be artistic licence," says Johannes von Trapp. He is the youngest son of Georg and Maria - the decorated naval commander and singing nun turned governess of the film. "This was the Hollywood version of the Broadway version of the German film version of the book that my mother wrote. "It's like the parlour game where you whisper a word in your neighbour's ear and he whispers it and it goes around the room - by the time it comes back it's usually changed a bit." When the Sound of Music came out in March 1965, 20th Century Fox put on a special screening for the family in New York. Johannes was a young recruit in the US army and applied for leave but was refused. Johannes von Trapp spoke to Louise Hidalgo for Witness on BBC World Service Radio. Listen on air and online from Monday 2 March. "So I went absent without leave. I borrowed a car from a friend and I had to save my last dollar for the Holland tunnel to get across the Hudson River. "A lot of my family's friends were there, and my mother of course, and my brothers and sisters. And it was very emotional and powerful. I remember at the wedding scene my mother got up from her chair and started walking towards the screen, she was so impacted." In real life the oldest von Trapp child was Rupert but in the film it's a girl, sixteen-year-old Liesl who falls in love with the boy who delivers telegrams, Rolfe. "In the real family my oldest sister was Agatha and she was a very introverted person," says Johannes, "and the thought of her doing that song and dance routine with the telegraph boy had us all rolling in the aisles in stitches." Johannes was born in 1939 - by then his mother and father had been married for 12 years and had already had two children together, to add to the seven that the widowed Captain von Trapp had from his first marriage. In the film the couple marry in 1938 and as Johannes says: "It was quite tough enough with seven kids for the movie company." The von Trapp children also already played music before Maria came to their home as a governess. "My mother was the energy and the instigator that took them to almost concert quality," says Johannes. But it was another important figure in their life, the priest, Father Franz Wasner, who was instrumental in their musical success, touring with them in Europe and America. He was left out of both the film and the Broadway musical. Another more hurtful change was the portrayal of Georg von Trapp. Far from being the distant rather domineering father of the Sound of Music, Johannes says he was "a very charming man, generous, open, and not the martinet he was made out to be both in the stage play and in the film. My mother did try to alter that portrayal for the film, but she was not successful." It was Maria von Trapp's book, The Story of Trapp Family Singers, which was published in 1949 that inspired first the musical and then the film. The family had lost all their money when the Austrian bank that held it failed in the 1930s - they managed to keep their villa outside Salzburg. But after the Nazi annexation of Austria in March 1938, life became increasingly untenable and later that year they left. They didn't cross the mountains as shown in the film though - they went by train to go on a concert tour from which they never returned. They finally travelled by boat to New York and when they arrived had only a few dollars to their name. They continued giving performances and later bought a farm in Vermont where the family still runs a hotel, the Trapp Family Lodge. But when Georg died in 1947 Maria was left with 10 children to support. That's when she wrote the book which became a best-seller. A German-language film and the musical followed. Maria later recalled, in a BBC interview, that she only learned Hollywood was making a film when she read about it in a newspaper. "I felt very alarmed," she said. "I didn't know what they are going to do with us… Hollywood being Hollywood, [I thought] they will have me three times divorced and five times married or whatever. And then it turned out so nice - especially the beginning with the mountains and me coming up over the meadow." She had some reservations about how her character, played by Julie Andrews, was portrayed though: "My long drawn out misery is, I can't get these diverse Marias to be as wild and untamed as I was at that age - they are all very ladylike you see and I was not." "She did everything quickly. She walked very fast, with a rolling gait developed from hiking in the Austrian mountains and it was hard to keep up with her. She ate fast, she drove too fast. My wife borrowed her car once to go the village, and was astonished that everyone in front gave way when they saw my mother's car coming." 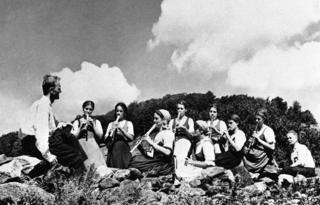 Music was always part of the von Trapps' life, even when they weren't performing. "I can remember times I'd be washing the pots and pans in the kitchen and my sister Hedwig had been cooking, and we'd start singing and harmonising, and then another family member would come and join us. And soon the guests would leave their tables and come into the kitchen to hear us sing," says Johannes. He acknowledges that it has been hard at times to live alongside the Hollywood version of their life. "But I've come to grips with it," he says. "There were many years when I really was annoyed by it. But I've been so impressed by how many people say it's been inspirational to them, that I put it on one side, in the public performance part of my life, and get on with my own life in private."